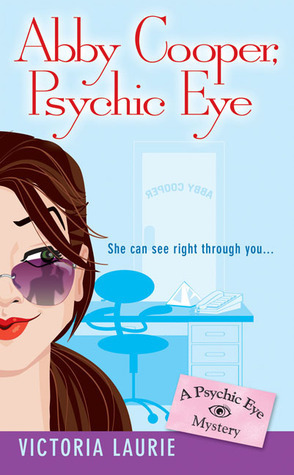 Abby Cooper is a P.I., psychic intuitive. But her insight failed her when she didn't foresee the death of one of her clients--or that the lead investigator for the case is the gorgeous blind date she just met. Now, with the police suspicious of her abilities and a killer on the loose, Abby's future looks more uncertain than ever. This book wasn't stand out fantastic or anything. In fact, on my own personal scale of likability (which is maybe a bit less nicer than Goodreads' star scale), a four-star review corresponds simply to "I liked this book, but not like REALLY liked it, liked it." It also slightly detours into, "This was a good and enjoyable book, but it's not like I'm going to rave compliments on it and lose sleep over getting the second book read, or neither am I going to go out on a limb to recommend that everyone read this book," because, honestly: So many books, so little time. So..., adjusting to the Goodreads' star ratings, I would actually have to place this one at a 3.5 Stars, leaning more towards 4 stars. Anyway, done with my tangent so that my review actually looks longer than I had planned for... Yeah, I ramble, but whatever. Abby Cooper was a fairly enjoyable read for many reasons. It had good writing, smooth transitions and great descriptions. I liked Abby's voice and character; she's feisty and no-nonsense, which is always a plus for female main characters. The characters were fleshed out pretty well and the mystery was interesting to follow along with. I really LOVED Eggy the little dog, but who doesn't like dogs? I liked the way Abby's psychic abilities are described -- blurting out a series of "clues" to determine what's going on in her client's life and what might happen and what they should do. It's pretty interesting. Unfortunately, there was nothing extraordinarily outstanding about this book. The one word I can think of would be "flat" when it came to a few aspects. Mainly, it was Dutch Rivers as well as a lack of a "gasp, surprise, surprise!" factor. The way that the story was written, there's a LOT of foreshadowing, so you pretty much expect things to happen, and even before they happen (like an entire chapter before) you already see the event taking place. So there's no surprise factor or surprise twist that actually gave that "chilling willies" feeling -- it was only slightly disappointing since I live for the intensity of surprise twists in murder mysteries. So while the ultimate "whodunit" was kept secret pretty well, there was no build-up of suspension to the end point. I didn't know who the murderer was, but I predicted pretty much everything else. If this had been the intention of the author to flow in tune with "psychic reading" style of foreshadowing, then I guess I don't have much of a complaint. I'll read the rest of the series with this adjusted mindset. It's really not a very big complaint since I enjoyed the book anyway. What the book DOES do is leave me interested in seeing what will happen in the coming books. I'm at least hoping that Dutch Rivers gets fleshed out a little more though, because his character fell pretty flat for me in this first book. And since he's a main character in the entire series, we'll need to make sure I actually like him. Right now, to me, Dutch Rivers is really just "Love Interest #1" who may or may not be significant enough for me to care. I will mention: I absolutely adore character interaction in books. The relationship between Abby and her sister, Cat was phenomenal. I actually look forward to seeing more of these sister together, even if it IS just to watch Cat continue to high-power her motherly instincts all over Abby, with Abby muttering and pouting in a corner about it.